What child has not been amazed by Harryhausen's work? What current special effects artist has not been inspired? He's most well known for his remarkable work with stop action animation (or, as he called it “kinetic sculpture”) for such films as The 7th Voyage of Sinbad, Clash of the Titans, and his masterwork Jason and the Argonauts. I used to watch these films with my dad, and if you haven't seen them, you owe it to yourself to take a look – especially Argonauts. 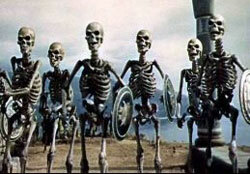 Harryhausen single handedly kept the art of stop motion alive in the industry for years until it regained favor with artists like Tim Burton and Aardman Animations. Clash of the Titans figurines are available from Gentle Giant and a new collection of his early work is out now on DVD.